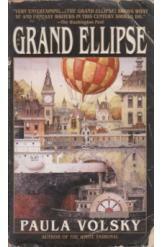 Grand Ellipse by Paula Volsky, Sci Fi. Book is in good condition, all pages intact. The civilization of Vonahr abandoned magic long ago, but now must rediscover it in orer to resist a brutal invader. Adventurer Luzelle Devaire is sent to recover the Sentient Fire, a weapon of forgotten magic that could turn the tide. To recover it, she must win the Grand Ellipse.